Looking for a Used G-Class in your area? CarGurus has 1,059 nationwide G-Class listings starting at $19,995. Reminiscent of those ‘70s-era Range Rovers and Land Cruisers that introduced the world to the sport utility vehicle, the 2014 Mercedes-Benz G-Class has kept its no-nonsense, box-like profile, yet continues to improve power numbers, prowess and posh. Make no mistake, however, that this is truly a niche vehicle with little to recommend it, practicality-wise, except status, though it does sport 79.5 cubic feet of cargo capacity with the rear seatbacks folded. A dedicated rock crawler, this 5-seat luxury sport ute is expected to return with a pair of trims: the base G550 and the turbocharged G63 AMG, the latter a product of Mercedes’ AMG racing division. Both trims come with standard full-time 4-wheel drive (4WD) that sports all-wheel-drive (AWD) agility on dry pavement and the ability to divert torque from the wheels that slip to the wheels that grip in sloppy conditions. Then this rugged 4WD system goes on to offer three locking differentials (center, front, and rear) that can be engaged sequentially for a multitude of mountaineering maneuvers. Alas, the question inevitably remains: If you’re well-off enough to afford one of these beasts, why would you want to take it far from the admiring suburban crowd? In any case, look for this squared-off Mercedes to sport, in its entry-level G550 iteration, 18-inch alloy wheels, a power sunroof, step running boards and heated power-adjustable mirrors outside, with premium leather upholstery, leather and genuine wood cabin accents, full power accessories and heated power-adjustable front seats gracing the inside. Cruise control, telescoping tilt-wheel steering, a rearview camera, front and rear parking sensors, and a remote garage door opener adorn both G-Class trims, as does dual-zone climate control, and Mercedes’ touted COMAND infotainment system with its 7-inch display that monitors the standard navigation system and Bluetooth hands-free calling. Entertainment, meanwhile, is offered via a premium Harman Kardon audio extravaganza that sports 450 watts of power, a 6-CD changer, 12 speakers, a video monitor, satellite radio, a memory card slot, and various Mbrace-interfaced smartphone apps. The up-powered G-Class G63 AMG, as noted, carries all the bells and whistles of its lesser sibling, as well as standard 20-inch alloy wheels and auto engine start-stop technology that may fool some into thinking this beast is actually good on gas. Meanwhile, options are few in this already well-equipped luxury ute, but upgraded wheels, and unique interior accents and colors are available as accessories. Powering the entry-level G550 is a variable-valve-timed (VVT) 5.5-liter V8 engine that mates with the standard 7-speed shiftable automatic transmission (with steering-wheel-mounted paddle shifters) for 382 hp and 391 lb-ft of torque. Mileage, however, is estimated at a distastefully wasteful 12 mpg city/15 highway. The potent twin-turbocharged version of the 5.5-liter V8, along with the 7-speed shiftable automatic (again with steering-wheel-mounted paddle shifters), endows the G63 AMG with 536 hp and 561 lb-ft of torque, while gas mileage gets even worse at 12/14. Finally, towing, again a somewhat far-fetched concept for those who have the wherewithal to flaunt the fashionably retro G-Class, is maxed out at 7,000 pounds with the proper equipment. Standard safety equipment of note aboard both 2014 G-Class editions is expected to include 4-wheel antilock brakes (ABS), traction and stability control, front and rear head airbags, and front side-mounted airbags. Daytime running lights will remain standard, as will turn-signal-integrated mirrors, front fog/driving lights, Mercedes’ PreSafe pre-collision safety system, and a post-collision safety system bolstered by Mbrace emergency communications and alerts. Finally, blind-spot monitoring and a remote antitheft alarm also will return as standard safety equipment aboard both trims this year. 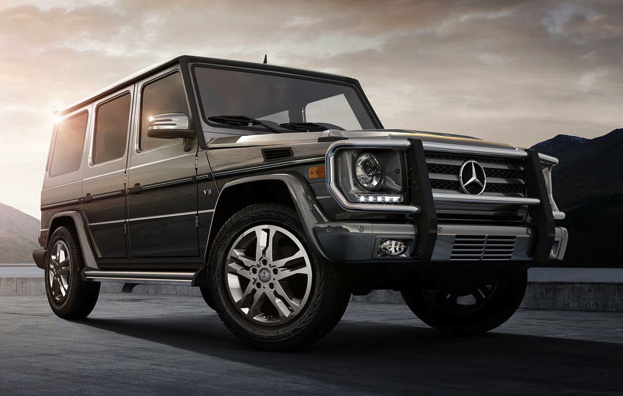 What's your take on the 2014 Mercedes-Benz G-Class? 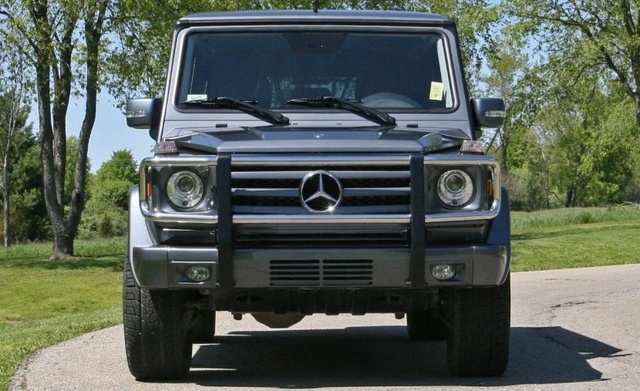 Have you driven a 2014 Mercedes-Benz G-Class? My right side tail light comes on then goes off how do I fix that problem. I bought brand new bulbs and still having same problem. How Will The Tires On The 2014 G63 Perform In Snow?